NES Darkman (USA) in 09:27.1 by thelegendarymudkip. Darkman is a game loosely based on the movie of the same name. 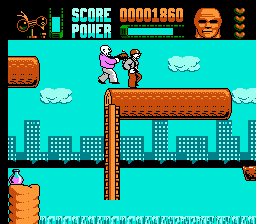 In this side-scrolling platformer, the player controls Darkman, a superhero who can jump, kick and punch, as well as swing from a rope during action sequences between levels. In each level, Darkman disguises himself as the boss of the level, whom he must defeat before the time limit runs out. In this TAS, thelegendarymudkip uses various tricks and glitches in order to reach a time of under 9 minutes and 30 seconds.